Market Meltdown: As the Bank Goes Down, Will You Come Out On Top? Wild market instability triggers a bank run that picks up uncontrollable momentum - and only you can stop it! Players take on the role of traders scrambling to raise enough capital to pay back their depositors. 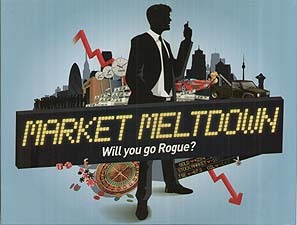 A fast and furious game only for those with nerves of steel - as the crisis deepens, you're forced into bigger stock market gambles in order you stay in the play! Will you go bust or will you be the last one standing. ?